These snacks do double duty by satisfying your appetite and delivering nutrition. Shopping for healthy snacks can be overwhelming and confusing—especially in a health food asylum such as Whole Foods. For me, snacks need to fulfill two requirements: offer some nutrition value so I'm not snacking on empty calories, and they need to hit the pleasure centers of salty, sweet, and crunchy (or any combination of the two). I scoured the shelves of our local Whole Foods (read: I stood in the aisle with a notepad dissecting nutrition labels, ingredient lists, and finally snacking my way into a midday nap) to bring you the best choices. 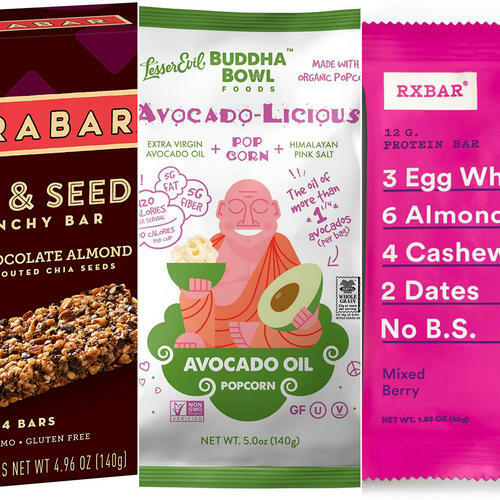 These snacks are well worth stocking your refrigerator, snack drawer, and your face with. These crunch-tastic bars are made with simple, whole-food ingredients such as sprouted chia seeds (sprouting unlocks more nutrients for you to absorb), nuts, coconut, and cacao. They're just sweet enough to satisfy a sugar craving while only boasting 7g sugar per bar. Per bar: 200 calories, 45mg sodium, 4g fiber, 5g protein. I know a kale chip is painfully predictable for a dietitian snack roundup, but hear me out: these chips are far superior to any other veggie-based chip I've tried. They're delectably crunchy, exploding with flavor, and pack 5g protein into each serving (which is HALF the container). I can't even with this kale. Per serving: 121 calories, 116mg sodium, 2g fiber, 5g protein. There are two things I love about this light-as-air popcorn: 1. There are only four ingredients (organic popcorn, avocado oil, coconut oil, and Himalayan salt) and no artificial color or flavors (hear that, Orville Redenbacher? ); and, 2. It's made with avocado oil, which is rich in heart-healthy monounsaturated fats, as well as vitamins A, C, and E.
Per serving: 120 calories, 190mg sodium, 5g fiber, 2g protein. This new-to-the-market cottage cheese boasts probiotics (which you won't find in other cottage cheese brands) and makes for a protein-packed snack. 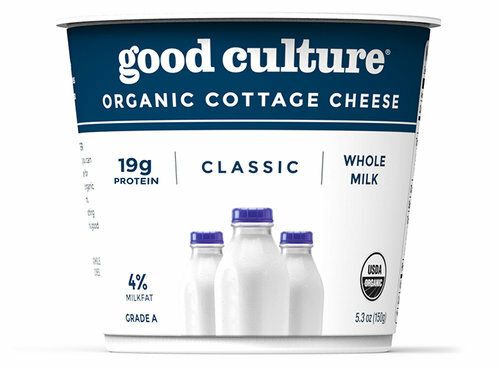 Good Culture's range of cottage cheese flavors are made with whole milk from pasture-raised, grass-fed cows and are free of stabilizers and additives. Coupled with a thicker, creamier texture than traditional cottage cheese, this brand is worth seeking out. Per 1 (5.3-oz.) container: 150 calories, 450mg sodium, 0g fiber, 19g protein. Lightly sweetened with coconut sugar and baked with coconut oil, this granola offers chocolatey goodness with a probiotic boost to help support a healthy immune and digestive system. Try it as a salty-sweet yogurt topper or simply enjoy it by the handful. Per serving: 130 calories, 120mg sodium, 2g fiber, 3g protein. Basically an everything bagel baked into crunchy, whole-grain snack crackers. Sturdy enough to take on a bounty of toppings, these crackers are best paired with a spreadable cheese wedge, such as Kerrygold Dubliner, hummus, or egg salad. Per serving: 150 calories, 220mg sodium, 3g fiber, 3g protein. With a transparent ingredient list of only seven items and zero added sugar, these bars get their sticky sweetness from dates and provide up to 24% of your daily fiber goal, plus a hit of quality protein (from egg whites and nuts). Per bar: 210 calories, 130mg sodium, 5g fiber, 12g protein. Made with sprouted grains and seeds, these bean-based chips were a staff favorite for many reasons. A toasty flavor with hints of garlic and onion, and a delicately crisp texture make them a delicious dip-less choice. Bonus: each serving boasts over 270mg of omega-3 fatty acids. Per serving: 120 calories, 80mg sodium, 3g fiber, 3g protein. Kid-friendly (think green Cheetos) and 70% made from whole peas, these light-as-air crisps are perfectly salted and powered by plant protein. If you can't get your daily vegetable quota in any other way, at least keep a bag of these at your disposal. A protein-rich mix of heart-healthy almonds, walnuts, cashews, and hazelnuts await you in this low sugar, sodium-free trail mix. Raisins add just the right dose of sticky-sweetness to counter the crunch. Per serving: 140 calories, 0mg sodium, 2g fiber, 4g protein.